Above, a street scene in Tower Hamlets. Fidei Defensor (feminine: Fidei Defensatrix) has been a title borne by English and later British monarchs since it was granted on 11th October 1521 by Pope Leo X to King Henry VIII of England and Ireland. The title was conferred in recognition of Henry’s book Assertio Septem Sacramentorum (Defence of the Seven Sacraments), which defended the sacramental nature of marriage and the supremacy of the Pope. This was also known as the “Henrician Affirmation” and was seen as an important opposition to the early stages of the Protestant Reformation, especially the ideas of Martin Luther. Following Henry’s decision to break with Rome in 1530 and establish himself as head of the Church of England, the title was revoked by Pope Paul III (since Henry’s act was regarded as an attack on “the Faith”) and Henry was excommunicated. However, in 1544, the Parliament of England conferred the title “Defender of the Faith” on King Henry VIII and his successors, now the defenders of the Anglican faith, of which they (except the Catholic Mary I) remain the Supreme Governors (formally above the Archbishop of Canterbury as Primate). Last night on ITV there was the start of the second series of Victoria with the lead character played by the actress Jenna Coleman. As is typical nowadays, a great deal of artistic licence is taken with the script and plotlines. One aspect that was based in reality was the degree of actual executive power the young Queen Victoria had at the start of her reign. The reign of Queen Victoria was the reign where the British monarch was finally reduced to that of constitutional figurehead. It was however a gradual process over the years 1837 to 1901. Today, we have the situation where the considerable executive power of the British Sovereign is exercised by the Queen’s ministers – who are of course accountable to the House of Commons which is elected by the British People. What is not commonly appreciated is that this applies to the title Fidei Defensor. When the Bill of Union was being piloted through Parliament in 1800 King George III had concerns about aspects that he thought would compromise his ability to perform his duty to “Defend the Faith” – meaning of course the Protestant Christian Faith. We are not in today’s article going to journey into this part of the UK’s history however. What we are going to do however is to raise concerns that the defence of the Christian faith is NOT being done in the case of a five year old girl who has been fostered by a Muslim family in Tower Hamlets. The five-year-old girl, a native English speaker, has spent the past six months in the care of two Muslim households in London. The foster placements were made, against the wishes of the girl’s family, by the scandal-ridden borough of Tower Hamlets. A social services supervisor describes the child sobbing and begging not to be returned to the foster carer’s home because “they don’t speak English”. There are reports that the supervisor heard the girl, who at times was “very distressed”, claiming that the foster carer removed her crucifix from around her neck and has described the Christian festivals of Christmas and Easter as stupid and that white Christian women were drunkards and stupid. Now just in case there may be readers who would suggest that organisations like the EDL spew this sort of reports from it’s website most days the FACT that the respected Independent newspaper (hardly a “far right hate rag”) is reporting it give the report authority. British Gazette comment: In these cases a very good rule of thumb is to perform the exercise of “booting up the other foot”. “Booting up the other foot” means to ascribe the actions of one party to the actions of another – generally opposite in political ideology. Thus, let us suppose that a five year old Muslim girl was placed with a Christian foster family who told her that the Muslim festivals of Eid ul-Adha and Ramadan were stupid as were Muslim women who wore the burqua. We know that a prosecution for religious harassment would follow immediately! But of course to expect even handed treatment is to completely misunderstand the nature of the multicultural, multi ethnic, multi faith, diverse and “tolerant” society that is 21st Century Britain! This is a society that it’s leaders proudly claim, indeed boast of their tolerance. They exercise this tolerance by strictly enforcing “zero tolerance” against some (not all) forms of perceived intolerance. As the rapidly changing demographic structure of the country takes effect this situation is only going to get worse. 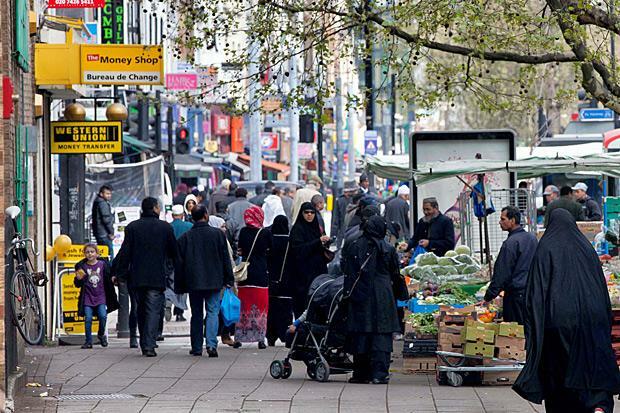 Places such as Tower Hamlets undergo great and rapid change not only because new people come into the borough but those living there move out. British Gazette comment: The Telegraph & Argus is Bradford’s local newspaper, not an EDL “hate-sheet”. Note to Somerset Police who are worried about the activities of Mr Overd: The above is an example of real (not imagined) Hate Crime. This controversy comes at an interesting time for UKIP members who are deciding on which leadership candidate to vote for!